In January 2018, the BBC responded to yet another complaint concerning falsehoods and anti-Israel smears promoted by Nabila Ramdani on the same programme by claiming that such calumnies are part of a “legitimate debate”. Nabila Ramdani of course was not expressing an “opinion” – she was intentionally making false statements (such as the allegation that Palestinians “are routinely murdered in their thousands” and the claim that the intent of US military aid to Israel is “to ruin their [Palestinians’] lives”) which inevitably influenced viewer opinion because they were not challenged by the programme’s presenter. “Thank you for taking the time to contact us again. We realise you were not satisfied with our earlier response. We raised your concerns with the Dateline London programme team and senior BBC News staff. As explained earlier, we allow guests on Dateline London to give their views, as the programme features a range of international correspondents from different publications and backgrounds. As a result the panel on this programme is expected to offer personal opinions, as opposed to impartial reporting from BBC correspondents. Nabila Ramdani’s viewpoint is one of a number held on the Middle East – we feature a range of opinions over time, even if some viewers will object to a particular outlook. We appreciate it would have been better to highlight such views would be disputed by the White House and Israel, but our presenter aimed to get the discussion back on track rather than prolong the digression. We don’t feel our editorial guidelines have been broken however. The edition of ‘Dateline London’ broadcast on May 19th and 20th 2018 included a segment relating to the incidents that had taken place five days earlier on the border between the Gaza Strip and Israel. Three days before this programme was aired Hamas had admitted that fifty of those killed were, according to what Hamas described as “official figures”, members of the terror organisation. Unsurprisingly, one of the contributors invited by ‘Dateline London’ to discuss that topic and others was Nabila Ramdani. Also on the panel were Stephanie Baker of ‘Bloomberg’, Thomas Kielinger of ‘De Welt’ and Polly Toynbee of the ‘Guardian’. Presenter Shaun Ley introduced the item (from 09:51 in the video below) with a reference to the 1947 Partition Plan – about which the BBC famously has some long-held – but erroneous – beliefs. Although evidence showing that the people described by Ley as “protesters” had carried out several shooting attacks, thrown petrol bombs and attempted to place explosive devices on the border fence had been in the public domain for five days, BBC audiences still heard no mention of that violence. Moreover, the “information for viewers to make up their own minds” that the BBC has claimed this programme provides did not include any mention of the fact that the majority of those killed were affiliated with a proscribed terror organisation. Ley brought in Ramdani to comment first, failing to inform audiences of the fact that the “protests” were held under the banner of the Palestinian “right of return” – which is aimed at eradicating the Jewish state – and thus meaning that his musings on the ‘peace process’ are obviously at best academic. Obviously Ley should at this point have clarified to viewers that prior to the May 14th incidents Hamas’ leader in Gaza, Yahya Sinwar, had on several occasions indeed urged Gazans to breach the border en masse and become ‘martyrs’ – but he refrained from doing so. Ley made no effort to clarify to viewers that there is no lack of food in Gaza and that shortages of electricity and medical supplies have nothing whatsoever to do with Israeli (and Egyptian) counter-terrorism measures but are in fact related to infighting between Hamas and Fatah. Ley should have pointed out at that point that those ‘Great Return March’ participants who did indeed stay away from the border fence were of course completely safe – but he did not. Viewers next heard Thomas Kielinger tying the incidents in Gaza to the relocation of the US embassy. Next up was Polly Toynbee. Toynbee then effectively claimed that rioters planting IED’s on a border fence, carrying out shooting attacks, throwing petrol bombs and setting fire to farmers’ crops with incendiary kites is just like good old England. Later on Nabila Ramdani let slip a clue indicating that actually she (and presumably others around the table, because no one questioned her) is aware of what viewers of this programme were not told: the fact that not all the ‘protesters’ were peaceful and that most of those killed were linked to terror groups. Shaun Ley’s nods when Ramdani alleged that Israel is “murdering Palestinians” are particularly noteworthy. Obviously viewers of this programme did not hear “a range of opinions” from its contributors and Shaun Ley’s rather lame efforts to present a different view did not include providing BBC audiences with essential information concerning the violent nature of the event under discussion and the fact that the majority of those described no fewer than three times as “unarmed protesters” were in fact linked to a terrorist organisation. In those nine minutes viewers did however see two mentions of a “massacre”, two references to “slaughter”, one allegation of “indiscriminate execution” and two references to “murder” – as well as portrayal of Israel’s government as a “barbaric regime” – all of which went completely unchallenged by the BBC presenter and with no right of reply afforded to the country accused of such acts. So much for the BBC’s claim last year that it had reminded this programme’s production team of “the need to ensure that any contentious remarks are challenged and questioned”. In part one of this post we looked at the BBC News website’s coverage of the session held at the UN General Assembly on December 21st. In part two we discussed BBC World Service radio’s reporting of that story and in this post we will look at coverage of the same topic on BBC Radio 4, beginning with a programme aired before the vote took place. 1) ‘PM‘, BBC Radio 4, 21/12/17, presented by Eddie Mair, from 05:22 here. Mair then quoted statements made by Haley and listeners heard a recording of the US president speaking on the same topic before a rather confused Nada Tawfik was brought in to report from the UN. Which countries those unidentified quoted diplomats represent was not revealed by Tawfik but nevertheless, she chose to unquestioningly promote the inaccurate notion that the US recognition of Jerusalem as Israel’s capital “goes against international law”. In the same item listeners heard the recordings of the statements made by Nikki Haley and the Turkish foreign minister previously aired on BBC World Service programmes as well as a recording of Israel’s ambassador speaking at the UN GA. The item also included an interview with “an expert on international aid” – Cindy Wang – described as having worked at the US State Department under the previous US administration. Radio 4 also covered the story after the UN GA vote had taken place. 2) ‘The World Tonight’, BBC Radio 4, 21/12/17, presented by Shaun Ley, from 07:30 here. In addition, listeners heard the first segment of the interview with the Saudi Arabian ambassador to the UN broadcast on ‘Newshour’ on the BBC World Service. Ley then introduced his first guest. In response to Ley pointing out that both the US president and the US ambassador to the UN had clarified that the US announcement “does not preclude anything that might come out of peace talks”, the Turkish president’s advisor once again made inaccurate – but unchallenged – claims concerning the US announcement and international law. While Ley made no attempt to relieve listeners of the erroneous impression promoted by Aybet according to which the US decision to recognise Jerusalem as Israel’s capital breaches international law, he did allow her the time to praise her employer’s “leadership […] that will not be forgotten”. Ley’s second interviewee on the topic was retired US general and former vice Chief of Staff Jack Keane. During that conversation, Ley referred to Nikki Haley’s statement at the UN GA as “kind of almost cash for votes” and “tawdry”. Like BBC World Service radio, Radio 4 focused extensively on what it chose to portray as “threats” made by the US Administration prior to the UN GA vote and failed to provide audiences with relevant context and historical background to the story. However, as we see, listeners to BBC Radio 4 also heard inaccurate claims concerning ‘international law’ and the US announcement recognising Jerusalem as Israel’s capital in both these programmes. All the relevant UN Security Council resolutions are non-binding (Chapter VI) and do not create any legal obligations. Neither do they relate to announcements concerning Jerusalem. Clearly BBC Radio 4 listeners were materially misled on this issue and corrections are in order. The February 15th edition of BBC Radio 4’s ‘The World Tonight’ included an item (from 19:53 here) relating to that day’s meeting between the US president and the Israeli prime minister in Washington. Listeners then heard a recording of the US president speaking at that press conference which was apparently intended to support Ley’s claim that Trump had changed US foreign policy. Ley continued with what has become a standard BBC theme: promotion of ‘settlements’ as the main obstacle to an agreement, with numerous no less relevant factors such as the Hamas-Fatah split, Hamas’ rejection of the two-state solution or the PA’s refusal to recognise Israel as the Jewish state obscured from audience view. Another recording from the press conference was then heard. Ley then inaccurately told listeners that Netanyahu’s reply “Let’s try it” related to the topic of settlements rather than to a deal. Listeners then heard Manuel Hassassian again promote the inaccurate notion that the two-state solution was included in the Oslo Accords. 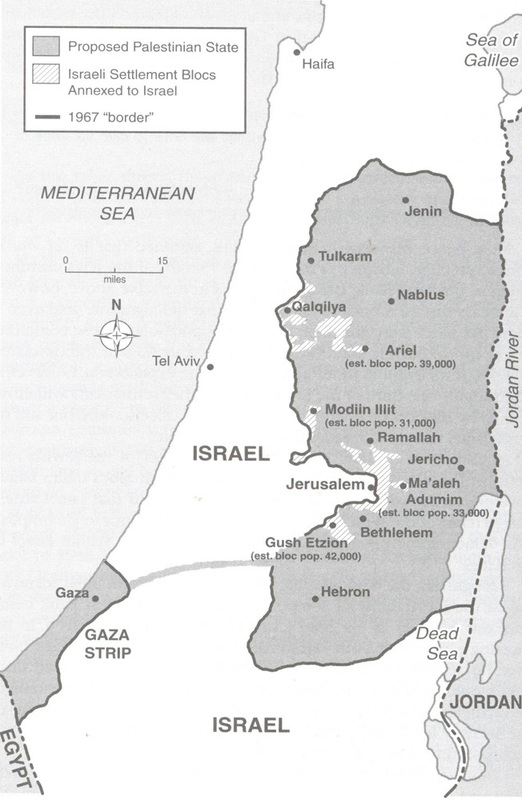 They also heard him make the false claims – completely unchallenged by Shaun Ley – that the 1949 Armistice lines are “borders” and that the definition of the two-state solution is that a Palestinian state would be established on all of the land occupied by Jordan and Egypt in 1948. Ley’s failure to challenge Manuel Hassassian on the claim that “settlements now are the major impediment” to an agreement is of course unsurprising since he too had made that same claim just minutes earlier, showing the extent to which the BBC has adopted the PLO’s talking points. Similarly failing to ask Hassassian why the PA initiated the second Intifada in 2000, why the PA refuses to recognise Israel as the Jewish state or what the PLO intends to do about Hamas’ refusal to accept the two-state solution, he continued. Apparently uninterested in Hassassian’s unveiled threats of violence and failing to clarify to listeners that the Quartet – which includes the EU – calls for “a negotiated resolution on the status of Jerusalem”, Ley closed the interview there. The BBC’s remit includes the priority of enhancing “UK audiences’ awareness and understanding of international issues”. Obviously the inaccurate and misleading claims made by the presenter together with his complete failure to challenge the falsehoods and propaganda promoted by his interviewee did nothing to contribute to meeting that objective. BBC Watch will be pursuing the outstanding issues. On June 9th – the day after the terror attack at Sarona Market in which four people were murdered and 17 wounded – BBC Radio 4’s programme ‘The World Tonight’ broadcast an item apparently intended to convey to audiences that any future outbreak of violence between Israel and Hamas would be down to one prime factor. Ley did not inform listeners that Lieberman’s order constitutes a return to previous policy or that the entry permits for Palestinians were frozen rather than “revoked”. Over a dozen attacks have taken place at Damascus Gate since October of last year. Contrary to the claims from Hosken, the attacks were not directed exclusively at members of the security forces and many Israeli police and border police officers are not Jewish. At least four civilians were wounded in attacks at that location. Neither were all the attacks at Damascus Gate “knife attacks” as inaccurately claimed: at least five shooting attacks took place, including the one on February 3rd in which Border Police officer Hadar Cohen was murdered. There were two terrorists involved in the Sarona Market attack and both came from Yatta which is in Area A and under full Palestinian Authority control. There are of course no ‘settlements’ in Areas A or B.
Hosken next went to Kibbutz Alumim in the Western Negev. As of July 2015 the population of the Gaza Strip was 1.87 million. The Hamas movement in Yatta claimed that the two terrorists belonged to its organization soon after the attack. Hosken then journeyed to Gaza. The checkpoint is actually Palestinian Authority – rather than “Fatah” – operated. Hosken then gave an inaccurate account of how the Gaza Strip came under Hamas control, completely erasing the terror organisation’s violent June 2007 coup from audience view. Listeners heard entirely unchallenged statements from three interviewees in Gaza, the first being “a prominent Fatah leader” whom Hosken asked about “the so-called Intifada of knives”. Hosken did not bother to clarify to listeners that Palestinians can in fact travel to Jerusalem with the appropriate paper work or that the security measures at crossings into Israel are the direct result of Palestinian terrorism. Listeners also heard from a similarly unchallenged porter whom Hosken asked “what he thought about the attack in Tel Aviv”. Listeners then heard from an associate professor of politics at Gaza’s Al Azhar University. Hamas – along with several other Palestinian factions – clearly has no interest in peace talks, as one presumes Hosken himself knows, and has spent the last two years rebuilding its terrorist infrastructure. Nevertheless, listeners to this item were led to believe that the main factor threatening to lead to a renewal of conflict is the recent appointment of Avigdor Lieberman as Minister of Defence rather than Palestinian terrorism. Apparently that is what passes for ‘reporting’ at BBC Radio 4. As regular readers will be aware, a permanent feature in BBC coverage of any story relating to the Boycott, Divestment and Sanctions (BDS) campaign against Israel is the avoidance of the issue of that campaign’s end-game agenda. 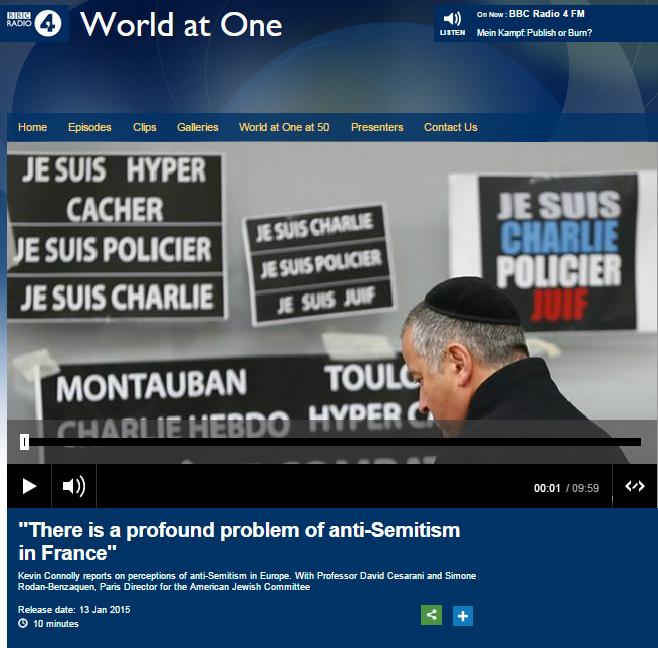 Almost identical messaging was previously found in an article from November 2015 and last July the BBC ran filmed, audio and written reports (see related articles below) all of which gave a platform to promotion of the BDS campaign but none of which included objective examination by the BBC of that political campaign’s real goals. Moreover, in response to complaints from the public about its inadequate portrayal of the BDS movement the BBC has stated that “It is not our role to seek out any “true agenda”” and hence a reasonable conclusion appears to be that the corporation is quite happy to continue portraying the political campaign to delegitimize Israel in the sanitised words of its supporters. All that means that when the BBC produced two items concerning the same BDS-linked story this week, audiences were already at a disadvantage because they have never been told by the corporation what the BDS campaign is really about. So did these two radio reports make any attempt to balance that chronic and crucial deficit in knowledge? On February 15th BBC Radio 4’s ‘The World Tonight’ asked “[s]hould local councils be able to boycott foreign goods or services?”. In fact, the plan was first announced last October and it also relates to other publicly funded bodies besides local councils. After a recording of Mr Hancock explaining the issue, listeners heard some clear signposting from Ley. Interestingly, that same spurious linkage was made in a statement put out by the BDS campaign’s Rafeef Ziadah (also an employee of ‘War on Want’) several hours before this programme went on air. Later on listeners heard the following description of the BDS campaign during the conversation between Ley and one of his two interviewees, Douglas Murray. Despite Douglas Murray’s efforts, listeners to this item still went away without any knowledge of the BDS campaign’s rejection of the two-state solution and its goal of dismantling the one and only Jewish state. The same topic was the subject of an item in the February 15th edition of the BBC World Service radio programme ‘Newshour’ (from 47:30 here). Presenter Rebecca Kesby framed the story as being about an ‘ethical’ issue in her introduction and also failed to clarify that the proposal was first publicised last year. Kesby’s guest contributors are the exact same two people who appeared in the Radio 4 item and the differences in their presentation to listeners are interesting. Whilst Shaun Ley described Richard Kemp as “a Liberal Democrat and former leader of Liverpool council”, Kesby made no reference to his political affiliations, introducing him as “a local councilor in the city of Liverpool”. Shaun Ley’s introduction of Douglas Murray described him as “associate director of the think tank the Henry Jackson Society which argues for an open and engaged foreign policy and is in favour of the market economy”. Rebecca Kesby, on the other hand, did find it necessary to introduce a political dimension to her presentation of Douglas Murray, describing him as “associate director of the Right-wing think tank the Henry Jackson Society”. Once again listeners heard nothing of the agenda which BDS campaign’s tactics of delegitimisation aim to bring about. Obviously this issue will be the topic of debate in the UK in the near future but unfortunately for members of the British public who get their news from the BBC, their ability to discuss this UK government proposal in an informed manner will be severely hampered by the fact that their national broadcaster has to date refrained from telling them the whole story about the BDS campaign – and apparently has no intention of doing so.